Reno is most famous as “The Biggest Little City in the World,” and the west’s original gambling town and the place long ago where wealthy easterners came to get divorced. With around 400,000 people in the metropolitan area, it has long since faded as the main gambling destination in comparison to Las Vegas, though it still has many casino resorts and still does a decent tourist trade. In recent decades, like many western cities, it has become more of a bedroom community for people seeking a high standard of life for a relatively low cost. As Reno’s tag would suggest, some of the physical form of the city is still suggestive of a small place. The main commercial drag through the city, Virginia Street, cuts a roughly north-south swath through the middle of downtown, and on the south side it long ago became the city’s main suburban commercial corridor, home to several newer (mega?) resorts and all 4 of the enclosed malls to ever call Reno home. Of the four enclosed malls, one, the Park Lane Mall, is long gone, demolished years ago and replaced by a rather lovely barren windswept lot. 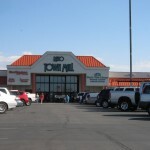 Another, the Meadowood Mall, is the only truly large super-regional mall in the metropolitan area, though several newer and fairly large “outdoor malls” have sprung up either further south on the strip or over in Sparks. 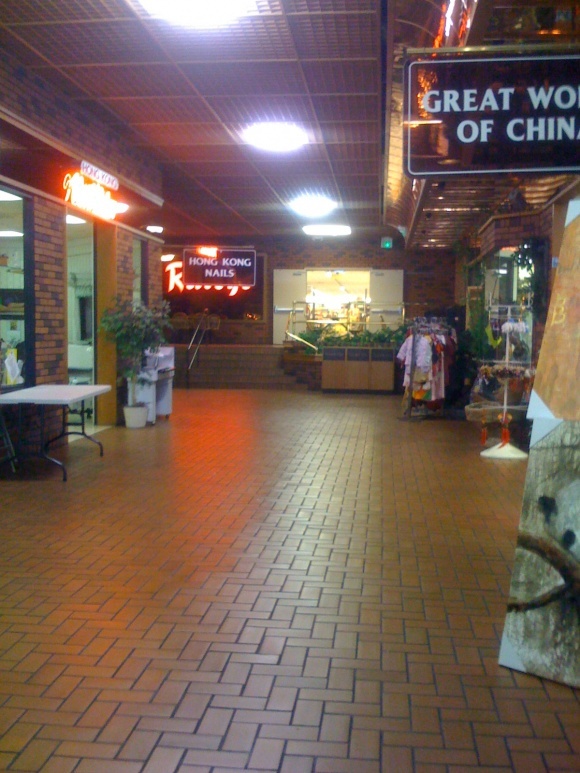 That leaves two more enclosed malls along South Virginia St., and both of them are small, strange, dated little centers. 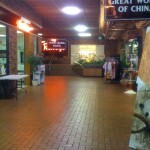 The Reno Town Mall opened in 1972 as the “Virginia Center,” at the corner of South Virginia Street and Peckham Lane. The original anchors were a Raley’s-owned “Eagle Thrifty” superstore and a Breuner’s furniture store, at opposite ends of the center. 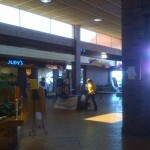 The owners would quickly declare bankruptcy, however, and in 1975 the mall as sold and renamed the “Old Town Mall” instead. 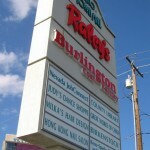 During this time a movie theatre opened in the center and Gray Reid, a popular downtown Reno retailer, moved into the mall. But its fortunes refused to turn around and by the early 80s the center was mostly vacant and dubbed the “Ghost Town Mall” by many in Reno. In 1982, the mall began a renovation to reposition itself, adding a Marshalls store as a new anchor, and attracting more tenants to bring occupancy up to 23 retailers. 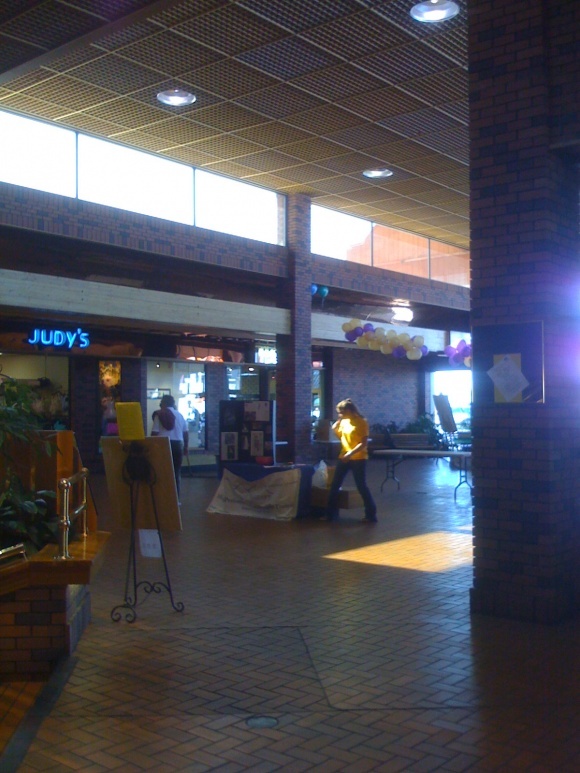 The mall continued to falter through the 80s however, and fills vacancies with non-traditional tenants such as a Washoe County Library, which opened in the rear of the mall in 1987, or a community college that opened in 1989. 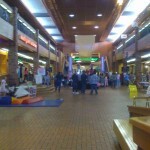 Around the same time, a small strip of outdoor stores was tacked on to one end of the mall. In 1989, Marshalls left the mall and it quickly fell into foreclosure, failing yet again. 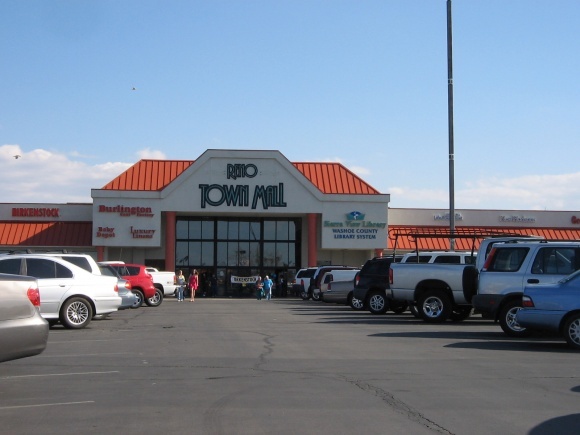 Roter Investments of Nevada snatched the mall up in 1992, leasing as much of its 280,000 square feet as possible, and brought the Old Town Mall up to 100% occupancy by 1995. 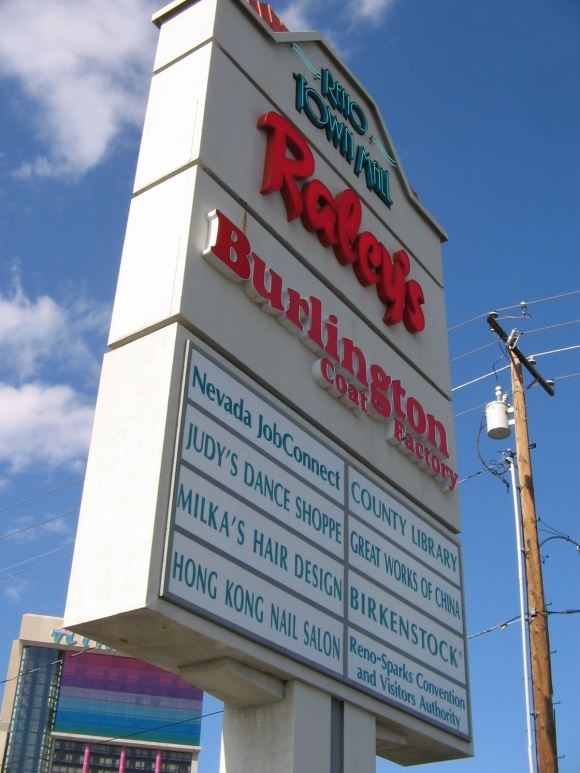 In 1999, Burlington Coat Factory replaced now-defunct Breuners as the largest anchor in the center. 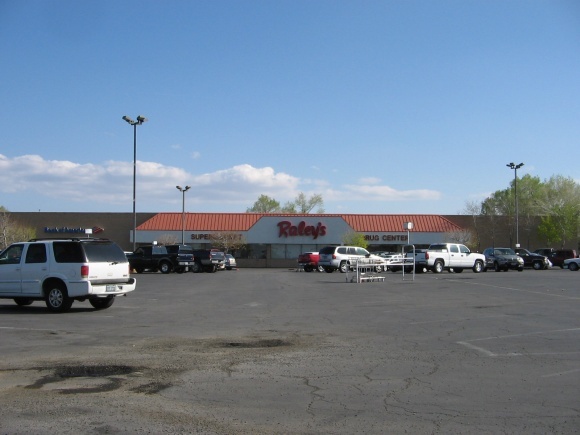 In 2000, deciding that “Old Town Mall” had bad connotations (good thinking), the center was renamed to its current moniker, the “Reno Town Mall.” More recently, Raley’s converted their store to the budget-oriented, warehouse-style “Food Source” concept. The Reno Town Mall’s design and architecture is actually very strange. From the outside, the center appears to be a fairly small strip center, with a tiny enclosed portion wedged between the Burlington Coat Factory and Raley’s anchors. Once inside, however, it becomes apparent that the mall slices lengthwise between the two stores–going back a ways from the front–and splits almost immediately into two separate levels, giving it quite a bit more of significance than it would appear from the street. 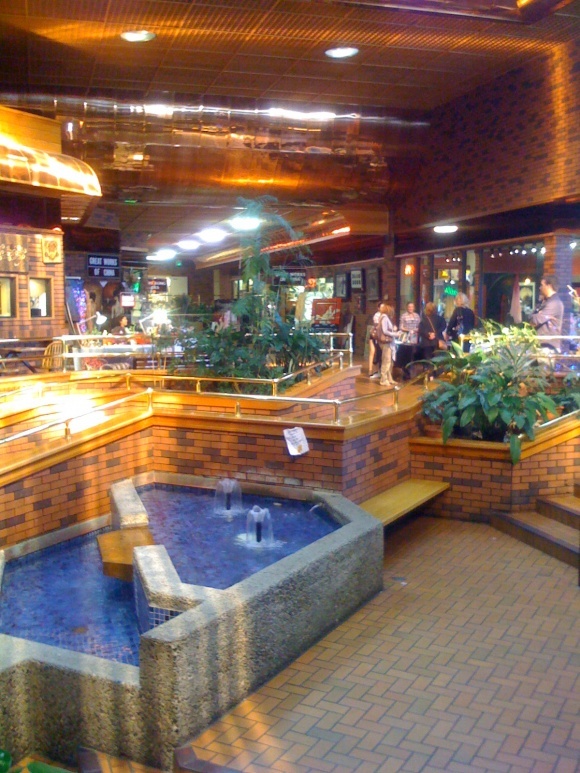 The interior is also deliciously ’80s garish, a sea of browns, coppers, and oranges with planters and fountains galore. I thought it was a real treat. As you can see from the pictures, the decidedly mixed-use center (there are still a ton of civic functions inside, including a library, community college, civic center, dmv, and more) actually generates a fair amount of foot traffic, and the collection of mostly mom-and-pop shops seem to do at least somewhat okay. Granted, things seem a bit more hopping than you’d expect in these photos because there was a little girl dance-off, or something, so I had to try harder than usual to not look like a creep. (A creep walking around by himself photographing little girls). The center is a bit small to be a real destination–and the collection of stores is just a bit too weird to encourage much cross-shopping–but it’s a pretty unique one of a kind gem nonetheless. It’s…it’s…beautiful! Especially in that first shot, all the brass and brick look really inviting. Glad to see this one is still filling a need in the community. You actually caught people in the mall? That was lucky. Although I haven’t been in a while, it’s always been deserted… even with the high occupancy rate. The Washoe County Library just isn’t a big draw. @Bobby P., the Burlington Coat Factory replaced the Marshalls. The anchor orientation to the mall is a little weird, since the mall goes straight back, with the anchors off to either side, rather than at either end like a typical dumbell. I need a good shorthand to refer to the layout…. instead of a dumbell maybe it’s a hot dog? Sheer ugliness that owes more to the 70s and than 80s. Given the eceltic tenant mix, I’m guessing that it doesn’t generate enough profit to justify a dredo, which will maintain it as a period peice for the foreseeable future. Ugly? I think it’s absolutely beautiful and relly speaks to me about my childhood dreams about what a quality mall would look like. What are those strange little signs pinned to the brickwork?? I think it’s absolutely awesome, it looks VERY identical to the old Greengate Mall outside of Pittsburgh which has since been demolished. Here is a prime example of where an interior make over would probably be justified. The place seems to have decent traffic and if the interior was redone so it is not so dark and dated, they might have a shot at filling in their empty stores. There is enough there already to at least attact some more mom and pop places. It is sad when a property owner just does not give a darn about the property or its future value or value to the community. 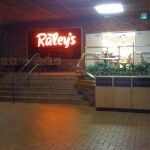 From the photos, it looks like a regular Raley’s to me. I dare to beg to differ and say that I rather like the interior, dated as it may be. Perhaps some touches of modernizing, I’ll give that, but to ‘whitewash’ this mall would make it look no different than others. 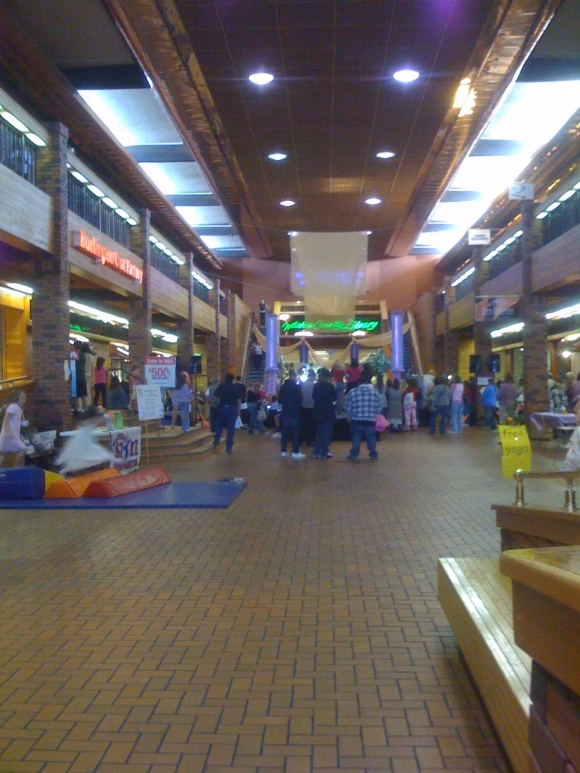 Something like what was done with East Towne Mall in Madison WI. 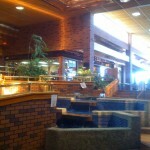 I saw how it looked before and after its 2003 remodel. It went from ‘bland late-1980s/early-1990s white-wash and neon”: to “toned down and warmer” hues and design elements. This blog featured that place a long time back. If the owners had that sort of cash and reason to go for that sort of look, it would keep the ‘toned down’ mood that I get from looking at these pics, while putting a modern spin on details. Do that and this place could actually hang in as a viable ancillary choice to the larger mall down the road. IF ANYONE CAN GIVE ME SOME INFORMATION ON WHO IS THE PROPERTY MANAGER OF THIS MALL IN RENO, NEVADA, THE RENO TOWN MALL, FORMERLY THE OLD TIME MALL, I WOULD LIKE TO KNOW. COULD NOT GET THE INFORMATION FROM THE SECURITY GUARD AT THE MALL . PLEASE EMAIL ME WITH THE INFORMATION TO GET IN TOUCH WITH THE PROPERTY MANAGERS OF THIS MALL. One thing that was missing from this description is that there was a small movie theater (3 screens, if I recall) between the entrance and what is now Burlington Coat Factory (my family saw The Lion King there). 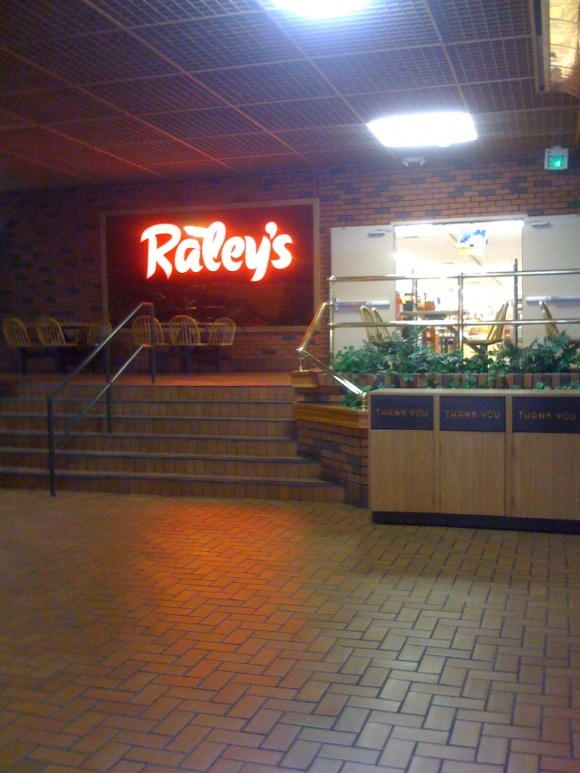 The photos were taken before Raley’s converted its store to Food Source. The neighborhood changed with more Hispanic residents, which dovetails nicely with the Food Source business model. The DMV Express office was tucked into the line space mentioned in the description, with a smog check station next door. With consolidations, the DMV Express office closed, but the smog check store is still there. I believe a discount cigarette store took its place. With the library, unemployment office, and state-sponsored college classrooms as long term tenants, it looks like the mall will survive. It doesn’t get much tourist traffic from the Atlantis Casino-Resort, just across the street, but locals frequent the structure. My daughter thinks that Burlington Coat Factory is the best store in town. @billddrummer, The movie theater used to be right across the hall from Round Table. It’s now some organic restaurant, which is pretty yummy. Haven’t been there since I was a little girl. I always liked the interior design & dark colors. I remember a wedding goods store that had nice candy, a comic book store, a Burlington Coat Factory (a company that gets very low ratings in Washington on Yelp for being filthy & unorganized), & a small movie theater that smelled of urine. I was looking it up out of nostalgia, after reading about malls across America that had been shut down. I’m really shocked this one’s still operational. My goodness, I’d completely forgotten about Breuner’s! 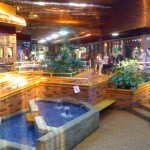 I spent a bit of time in this mall in the late 80s and early 90s. 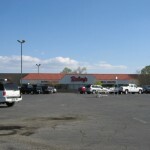 The Breuners was actually located in a large addition to the east of the main mall where Burlington Coat Factory is now located. Marshall’s was originally located at the back of the mall where the Washoe County Library now sits. 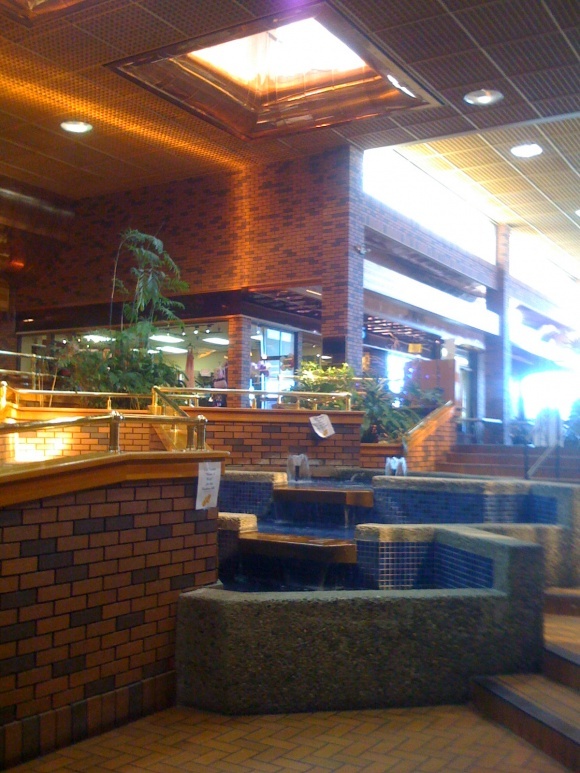 The library was originally located on the west side of the main corridor and moved to its present spot in the early 1990s when Marshalls left. As someone else mentioned, there was a small 3 screen theater on the east side of the main mall building with a Round Table across from it. It was tiny with the snack bar and theaters located down a flight of stairs in the basement. It was the type of theater that you’d go to only because it was still showing that summer’s blockbuster months after other theaters had stopped showing it. Other than that, the only truly memorable store was the Birkenstock store located at the main entrance. When I bought my first pair of Birks in 1988, the store was on the west side of the entrance but it moved to the east side sometime in the mid 90s. There was always something not quite right about this mall. The size, the layout, the lack of any interesting stores – it just never took off and has always been underutilized. It’s more 60s/70s aesthetics. I’d like to see more images, if you please. Someday it will be all that’s left of it.